Here I am with Eta! 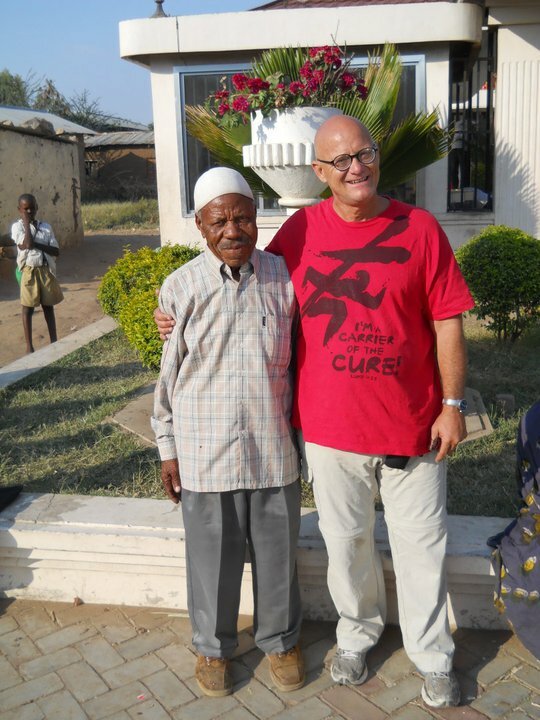 Eta is a sweet brother that came to Christ at one of our ministries in Bariadi, Tanzania. He came to hear the Gospel as we gave a message using paint talk. It is a language neutral Gospel presentation using a simple easel, paper and some paint. Literally hundreds prayed to receive Christ and were later added to the local church through Baptism. Eta works as a kind of butcher at the various food venues in that town, butchering goats, chickens and preparing fish. After his conversion, Eta would come by each day and ask me, through a translator, where I would be working each day and when I would come back to the hotel I was staying at. He frequently held hands with me during our conversations, a normal sign of friendship among those raised as Muslims. Many times I would return to my hotel and Eta would be waiting with his warm smiling face to greet me. We could hardly communicate but grew to love each other as our affections towards each other founded in our mutual faith was apparent to all. I cherished my time with him and hope to see him again soon. I am preparing to return to Tanzania and hope you will tune in and learn more about our ministry and the progress of the Kingdom in Africa. I cherish your prayers and partnership. My brother, I’m proud of you, and what you’re about to do in Africa. I will be a supporter, and want to let you know, I will always value the friendship we have, no matter where you and I may live.